Predictable calving ease specialist from one of the hottest calving ease herds. 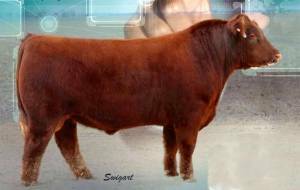 Unique outcross pedigree in a red package, big footed, structurally correct and flexible in his total movement with big testicles and clean sheath. Has the look to not only raise bulls and replacement heifers but show heifers as well.